"Smart renovations not only improve the utility and value of your property, they can also protect the value in a declining market or make it easier to sell." to retain or increase its value. Increasingly, Canadians prefer to relax, socialize and work at home. Renovation offers tremendous opportunities to create a home that reflects the way you like to live and contributes to your enjoyment of life, whether utility or comfort features, energy-saving modifications, or even to achieve a grander sustainable living objective. Secondly, many people undertake renovations to make their property more attractive to sell. Carefully selected and dependent on market conditions, these renovations can make sense whether in speeding the sale of a property or fetching a better price. On this note, there is a metaphor or story called the "boiled frog syndrome" which cautions people to be aware of even gradual changes in their environment or surroundings lest they suffer eventual undesirable consequences. In this case, the reference is to the inability to sell your home when you need to, and as an argument against living with the creeping normality of a decaying unmaintained property. So why wait until you are going to sell to improve your property? Do it now and enjoy it! "Forced Appreciation," a term he uses to describe the value you can create or add to your property through smart improvements, including quality upgrades, updates and maintenance. I like Scott because he has a passion in educating homeowners to make smart renovation and investment decisions that deliver financial rewards. Regarding 'forced appreciation,' he says you can build on your home investment as the market appreciates, and protect the value in a declining market. More about 'smart improvements' later on this page. Let's look next at the way people can finance these improvements. Depending on the scale of your project, there are a number of ways to finance your home improvements. For simplicity, let's divide the expenditures into smaller and larger projects. Credit cards - easy to get and convenient for smaller projects, but interest rates can be high to very high, and unpaid/outstanding balances can impact your ability to qualify or requalify for a mortgage. Requires discipline to repay the balance. Personal line of credit - easier to get, interest rate typically lower at prime rate plus 2 or 3%, and you can pay it off then re-use it. However, unpaid/outstanding balances can also impact your ability to qualify or requalify for a mortgage and require discipline to repay the balance in full. Home improvement loan - gets you funds up front at a competitive interest rate, and typically offers a structured repayment plan to make sure you pay the loan off in a specified time frame, say 1 to 5 years, and the longer the payback period the less impact on mortgage qualifying ratios. Deferred Payment Plan - typically used to intice you to purchase a particular product, such as a garage package or large appliance. Attraction is little or no payments for 1st year, but be careful, as the rates are typically approaching 29.9% after that, typically just a high-interest credit card in disguise. What's it Going to Take to Repay the Money? In all of the above, the trick is keep the renovation small and understand what it is going to take on your part to repay the debt in a given time frame. Understand whether you need a structured repayment obligation or have the discipline to make more than minimum payments if not! Here's an example: you intended your renovation to be only $15K but you end up with $24K on your credit cards because the project got away on you with all the bells and whistles. To repay the entire balance over 2 years you would need the discipline to 1) never use the card again, AND 2) pay ~$1220/month for next 2 years, bring total cost of renovation to over $29K! Could you even afford an extra $1220/month? A structured repayment plan or "installment loan" means the same monthly payment for a fixed term, say 5 years, and might be at a lower rate, say 7%, which might mean on your $24K project a $475/mo payment for the next 5 years and a similar $29K outlay. If you do end up with large credit card balances after a project, you could always talk to your bank about a 'consolidation loan' to convert the credit card debt into a lower interest rate product with a structured repayment plan to make it easier to pay back. HELOC or Home Equity Line of Credit - works much like a personal line of credit, typically at prime rate +, and you can borrow the money up to your limit whenever you want and repay as you wish. Requires discipline to repay the balance. Mortgage Add-On (2nd mortgage) - this is a loan on top of your existing mortgage. You must repay this loan in addition to the required payments on the original mortgage. More expensive than HELOC, but offers up front cash and a structured repayment plan. Refinance with Equity-Take-Out - this means you replace your existing mortgage with a new mortgage up to 80% of the property's appraised value. You end up with a lump sum of cash at the beginning of your project, and spend it as you see fit. Refinance Plus Improvements - this is a way to get 80% lending based on the NEW "as-improved" value of your property, not the existing value as in the above methods. This means access to more cash for extensive renovations, but comes with some strings attached, namely you get the money as the improvements are completed and inspected, not before. Purchase Plus Improvements - when you are buying a home, this is a way to get money in excess of the purchase price to be used for specific renovations as agreed to as part of the purchase mortgage financing. The extra funds available are based on the NEW "as-improved" estimated value of your property, in excess of the original purchase price. This means access to cash for extensive renovations, such as new roof, new kitchen, new bath, new windows and doors, etc. Again, you get the money as the improvements are completed and inspected, not before, and you can accomplish all this with as little as 5% down payment. In items 4 & 5, the trick to creating "as-improved" value that exceeds the cost of the renovations is to make quality and consistent renovations throughout the house, which compliment each other and increase the value of the whole house in the eyes of prospective buyers, as determined in advance by a licensed property appraiser. Below, we are going to talk more specifically about the Refinance Plus Improvement and the Purchase Plus Improvment loan products, why they are popular, how they work, and requirements for success. Meanwhile, if you have any questions please contact us. If you are not quite there yet, please read on! Rather than purchasing a new built home, many of our clients are purchasing an existing home in a desirable location, and then renovating it to their style. Or they already own the property, and want to modernize it. This could entail something as simple as adding hardwood floors, or as detailed as complete basement renovations. Earlier we talked about "smart renovations." Lenders can approve financing on the "as-improved" value of the renovations, which is different from and not necessarily the cost of renovations. This is an extremely important point to understand. Not all renovations result in an increase in the value of the property. Here is a Top 5 Reno List for Return on Investment. Energy upgrades: Whether you’re thinking about new energy-efficient windows, a new furnace, or solar panels on your roof, energy upgrades are a hot trend in home building and renovations, and typically bring with them at least a 50 to 75 percent return upon resale not to mention years of energy cost savings. The client (you) must provide in advance detailed quotes for the project, clearly outlining the scope of the work to be done and the cost. get quotes from legitimate, reputable contractors, and stores for the work involved. ensure the quotes are detailed, with all actions and materials clearly described. 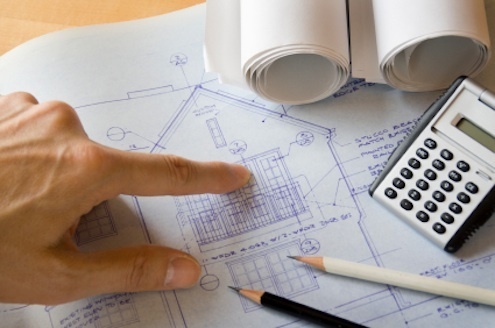 if construction permits are required, make sure you know that you can obtain them. we, as mortgage brokers, use this information to support your financing request and recap the work involved in our loan submission notes to the lender to help them understand your project. If the work can be easily confirmed by inspection after the fact, they might simply approve a reimbursement of, say, 80% for a kitchen renovation quote without the need for an upfront appraisal. For more complex projects, the lender may require an upfront appraisal of the property to determine the value "as-is" and "as-improved" based on your detailed quotes. The difference is the "improvement value." Upon mortgage approval, the lender advances the "value" of the improvements (less the borrower's required percentage) to your lawyer's 'trust account' to remain there until the necessary work is completed, inspected, and lender authorizes your lawyer to release these "hold back funds" to you. Multiple advances (or draws) may be available for larger projects, but generally there is only one advance at the end of the project. Very important to note is that you the borrower must complete the improvement on a timely basis before you receive the reimbursement. This means either you can cover the improvement costs yourself, or the contractor / store will carry the costs until after completion and inspection. Generally, there is a 60-90 day window to complete the improvements. In addition to the improvement funds, the lender also advances to your lawyer the approved mortgage amount required to purchase the home "as-is" or to replace the current mortgage in the case of a refinance, just in case you were wondering. With the help of their Realtor, Mark and Sheila find a house they would like buy in an excellent location, but it is 25 years old and the roof needs replacing, the window seals are gone, and the kitchen is out-dated. They have enough money for the minimum 5% down payment, but not enough for the renovations. Their Realtor tells them about the Purchase Plus Improvement program, so they negotiate a purchase price of $500K, which reflects the current condition of the home. Immediately upon the accepted offer and working with their experienced mortgage broker, they contact a window contractor, a roofing company, and a kitchen contractor to visit the property and write them up detailed quotes. Within a few days, the quotes come in: windows are $10K (average $1K a piece), the roof is $9K, and the kitchen comes in at $25K, so $44K in total. A mortgage request is made to borrow 95% of $544K (purchase price + quotes) and the mortgage is approved subject to confirmation of the "as-improved" value of the home by a licensed appraiser. An appraisal is ordered. With quotes and specs in-hand, the appraiser reviews the property and similar properties that have recently sold, and pegs the "as-improved" market value of the home at $550K. The mortgage is approved based on the $544K value (always lesser of cost or appraisal). On the possession date, the lender will advance $516,800 (95% of $544K) to the client's lawyer with instructions to hold-back $41,800 (95% of $44K) until the improvements are complete. The buyers provide the lawyer with the other 5% of the $544K, representing their down payment. As soon as their purchase transaction is approved, and prior to the actual possession date, the clients schedule their contractors to begin the work as soon as they have the keys. The contractors each require a 25% deposit, with the balance due on completion. Mark and Sheila don't really have the required $11K (25%) deposit and the bank doesn't pay until the work is complete, so they hit up the "Bank of Mom & Dad" to spot them the money as and when required by the contractors until their project is complete, bank-inspected, and the lawyer releases the $41.8K in hold-back funds. A Refinance Plus Improvements is very similar to the above, except that the home is already owned, and the clients must have at least 20% equity in the property, meaning their existing mortgage balance must be no greater than 80% of the current "as-is" appraised value of their home. All the other steps would be the same. Across Canada, renovation grants and rebates are available from the federal and provincial governments and local utilities, especially for energy-saving renovations. If you qualify, they may help pay for some of your project’s costs. See our Green Home Financing page for more details. As professional mortgage brokers, we can clearly explain your home improvement financing options. Large or small project, we have access to a vast network of mortgage lenders to find you the right mortgage at the right rate for project, whether purchase or mortgage refinance. Mortgage renewal time is often the perfect opportunity to review your options, so if you want to wait until then please feel free to register your mortgage renewal date and we'll touch base then. If you are ready to get started on your home improvement projct right now, please contact us, and we'll get your questions answered and the ball rolling.